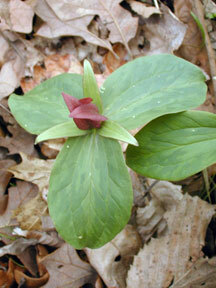 Also Called: Toadshade, toad trillium. Stems: Erect, stout, unbranched, smooth; base reddish-purple. Leaves: Whorl of 3 leaves at top of stem, sessile; blades broadly egg-shaped, 1.6 to 3.6 inches long, 1 to 3 inches wide, net veined, inconspicuously to strongly mottled, mottling becomes obscure with age; tips often abruptly pointed. Inflorescences: Single flower, sessile, terminal. Flowers: Fragrance pungent; perianth segments 6; outer segments 3, green, spreading to ascending, broadly lanceolate, .6 to 1.2 inches long, margins entire, tips pointed; inner segments 3, brownish-purple, becoming yellowish-green with age, erect, enclosing stamens, broadly elliptical, .8 to 1.6 inch long, broadest in lower 1/2 or near middle, margins entire, tips pointed; stamens 6, about 1/2 as long as inner perianth segments; anthers and filaments reddish-purple or purplish-brown. Fruits: Berry, nearly spherical, dark greenish-purple, pulpy, not juicy; seeds several per compartment, elliptic. Habitat: Rich, moist woods; deciduous wooded slopes; low, moist ravine bottoms; stream banks; rocky and non-rocky calcareous soils. Distribution: Easternmost counties of Kansas. Toxicity: The berries, seeds, and rhizomes of trilliums are thought to be poisonous. Uses: Native Americans and pioneers applied a poultice of crushed leaves to boils, snakebites, and stings. A tea made from the plant was taken for sickness. Comments: From Latin trilix "triple" in reference to the three parts of the flowers.